ostensibly were out to Christianize. This is a very good example of that idea. 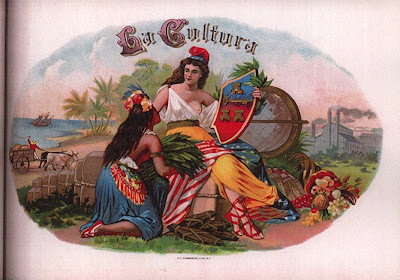 The white woman in this picture represents America, while the brown woman represents a backward even savage civilization kowtowing to America and offering up her bounty, in this case, tobacco and other exotic fruits. The ox cart to the left is emblematic of the backwardness of the native country, while the the factories in the background indicate the promise of what will come under American rule. The country is most likely Cuba, or some other Caribbean island nation. It was the beginning of the "American Century." Imperialism - it's a good thing to spread "the Culture" (La Cultura).